From using MySQL, I’ve used the ‘unbuffered queries‘ feature a number of times. It’s where you don’t fetch the entire resultset into memory at once – which is necessary if you’re retrieving more data than you have memory available. If’s often also generally gets results/data back to you sooner. Obviously requires you have a reasonably good ‘Vagrantfile’ to start with…..
One project I occassionally hack on is Xerte Toolkits. Yesterday on the mailing list it came up that someone was trying to use XOT with PHP4. After getting over some initial shock that people still use PHP4 (it was end-of-lifed in August 2008) I wondered how easy it would be to check the status of a code base to find how incompatible with PHP4 it now is. $ phpci print --reference PHP5 --report global -R .
$ phpci print  --report function -R . | grep 5. $ phpci print  --report class -R . | grep 5.
i.e. without me grep’ping the results. $ phpci print  --report class -R .
Which answers my question(s) and so on. So, I think I’ve changed ‘editor’. Perhaps this is a bit like an engineer changing their calculator or something. For the last 10 years, I’ve effectively only used ‘vim‘ for development of any PHP code I work on. I felt I was best served using something like vim – where the interface was uncluttered, everything was a keypress away and I could literally fill my entire monitor with code. This was great if my day consisted of writing new code. Unfortunately, this has rarely been the case for the last few years. I’ve increasingly found myself dipping in and out of projects – or needing to navigate through a complex set of dependencies to find methods/definitions/functions – thanks to the likes of PSR0. Suffice to say, Vim doesn’t really help me do this. Perhaps, I’ve finally learnt that ‘raw’ typing speed is not the only measure of productivity – navigation through the codebase, viewing inline documentation or having a debugger at my fingertips is also important. So, last week, while working on one project, I eventually got fed up of juggling between terminals and fighting with tab completion that I re-installed netbeans – so, while I’m sure vim can probably do anything netbeans can – if you have the right plugin installed and super flexible fingers. a 10 second slow down – that’s how long it takes to start Netbeans – even with an SSD and a desktop that should be quick enough (perhaps this is justification for a faster desktop?). Lesson learnt – do not close Netbeans. inline ‘warnings’ (i.e. unused variable, previously undefined variable[x], syntax errors etc) – so I don’t have to wait for them to appear in a browser or elsewhere. x – Fails with global variables on legacy projects though – in that netbeans doesn’t realise the variable has been sucked in through a earlier ‘require’ call. I did briefly look at sublime a few weeks ago, but couldn’t see what the fuss was about – it didn’t seem to do very much – apart from have multiple tabs open for the various files I was editing. Lack of Error handling / logging. Dare I uncomment the mysqi_real_escape_string and fix escape_str’s behaviour? In other news, see this tweet – 84% of web apps are insecure; that’s a bit damning. But perhaps not surprising given code has a far longer lifespan than you expect…. 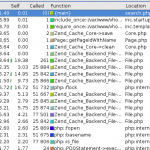 Zend_Cache – automatic cache cleaning can be bad, mmkay? Note how there are 25,000 or so calls for various Zend_Cache_Backend_File thingys (fetch meta data, load contents, flock etc etc). 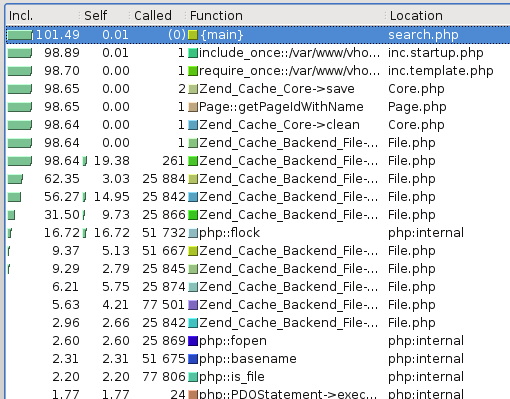 Zend_Cache has a ‘automatic_cleaning_mode’ frontend parameter – which is by default set to 10 (i.e. 10% of all write requests to the cache result in it checking if there is anything to garbage collect/clean). 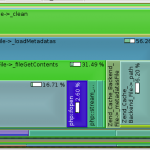 Since we’re nearly always writing something to the cache, this results in 10% of requests triggering the cleaning logic. Author David GoodwinPosted on July 5, 2011 Categories development, performance, phpTags performance, php, xdebug, zend cache2 Comments on Zend_Cache – automatic cache cleaning can be bad, mmkay? Recently I’ve been trying to cache more and more stuff – mostly to speed things up. All was well, while I was storing relatively small numbers of data – because (as you’ll see below) my approach was a little flawed. Random background – I use Zend_Cache, in a sort of wrapped up local ‘Cache’ object, because I’m lazy. This uses Zend_Cache_Backend_File for storage of data, and makes sure e.g. different sites (dev/demo/live) have their own unique storage location – and also that nothing goes wrong if e.g. a maintenance script is run by a different user account. My naive approach was to do e.g. The big problem with this is that the $cached_data array tends to grow quite large; and PHP spends too long unserializing/serializing. The easy solution for that is to use more than one cache key. Problem mostly solved. You’ll have access to igbinary_serialize() and igbinary_unserialize() (I think ‘make install’ failed for me, hence the manual cp etc). I did a random performance test based on this and it seems to be somewhat quicker than other options (json_encode/serialize) – this was using PHP 5.3.5 on a 64bit platform. 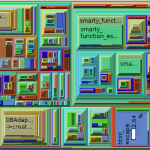 Each approach used the same data structure (a somewhat nested array); the important things to realise are that igbinary is quickest and uses less disk space. As per the ‘help’ documentation, it returns different exit codes depending how things went (e.g. 0 – everything good; 1 – warnings etc). Aside from the annoying compile step, this seemed the easiest to setup, and friendliest to use from the command line. This is the approach expected by Neil’s TestSuite above (more soon, perhaps). Download the Mozilla Rhino thing – for me this is a simple ‘apt-get install rhino‘ YMMV. Again, this will give some sort of return error code if it can’t parse it – but it’s not yet running through jslint… which is what we really want. If ‘result’ is ‘false’ then you can inspect the errors via JSLINT.errors. Next up, getting frontend-test-suite running, or something based upon it….